Every home cook needs to have a good Roast Chicken in their back pocket, but I have to admit that when I began cooking I found this a little daunting. The thought of roasting an entire foul, while making sure the skin is crispy and the meat was tender and juicy was TERRIFYING! However, the day came when I mustered up the courage to give it a try and what I discovered was that roast chicken is not only delicious, but it is so simple to make! 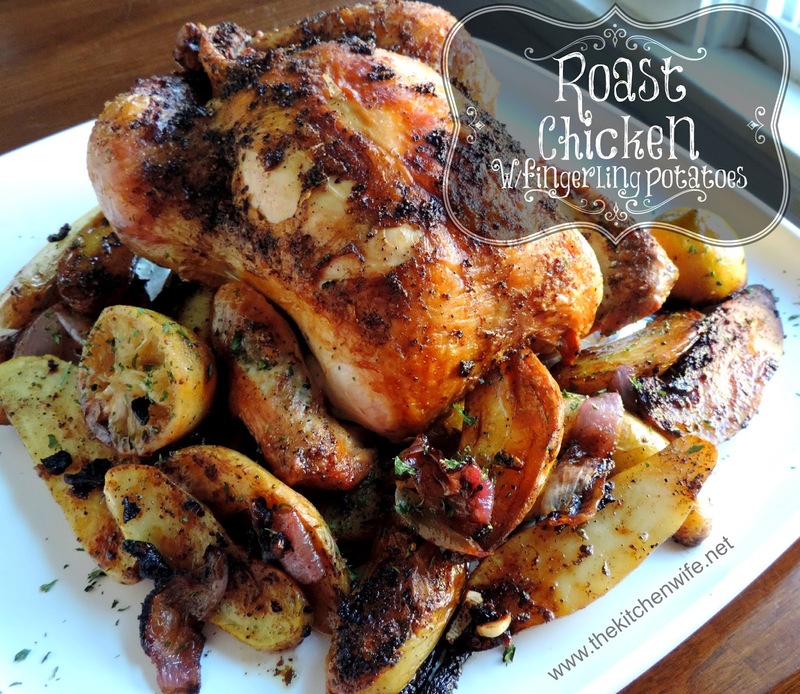 So let me ease any anxieties you may have about roast chicken and share with you the easiest recipe there is! Then you will need to remove the chicken from the wrapping and remove the neck and giblet bag from the cavity. You can save those for gravy or stock. Just put them in your freezer. If you are doing this from frozen, you will need to put the chicken in the fridge from the freezer at least a week in advance for it to thaw. Once you have removed the "goodies" from the cavity of the chicken, you will want to rinse and pat it dry. The next step is to season the cavity of the chicken with salt and pepper. I would use a tsp. of each. Then place the lemon, onion, garlic, thyme, and rosemary into the cavity. You don't have to peel any of the garlic or onion. See, I told you this was going to be easy. Now you will need to "tress" or tie the chicken legs together so that the items in the cavity do not fall out. I don't always have kitchen twine on hand so I make a slit in the skin on either side of the cavity opening and place the legs in them, in a criss-cross pattern. Now you will place my chicken on a roasting rack, in the roasting pan. Be sure to tuck your wings under. If you do not have a rack you can set the chicken right on on top of the potatoes. Now drizzle the olive oil over the chicken. Rub the oil all over the body. Then place the chicken into the oven for 30 minutes. After 30 minutes remove the chicken from the oven and set the rack to the side. Place the onions, garlic, and potatoes in the bottom of the roasting pan. Drizzle with oil, season with salt and pepper, and toss. Return the chicken to the pan and place back into the oven. You will know that the chicken is done when the juices run clear between the thigh and leg and a meat thermometer reads 165 degrees. There you have it and LOOK AT THAT!!! How beautiful is this bird!?! The skin is brown and crispy. The meat is so tender and juicy. Your family is going to LOVE IT! And let't talk about those potatoes huh. Crispy outside, tender middle, and beautifully caramelized. Don't let the fear of Roast Chicken hold you back any longer! Give this recipe a try and I promise this will become a Sunday favorite! Remove the neck and giblets from the cavity of the chicken. Season the cavity of the chicken with salt and pepper. Add the lemon, onion, garlic, thyme, and rosemary to the cavity of the chicken. Tie the legs together to ensure the "stuffing" will not fall out. Drizzle the olive oil over the chicken and rub it all over. Season the outside of the chicken with salt and pepper. Remove from oven and set the chicken on the rack to the side. Place the potatoes, onions, and garlic in the bottom of the roasting pan. Drizzle olive oil over them, season with salt and pepper, and toss. Return the chicken and rack to the pan and place back in the oven. Check to make sure the juices are clear and a meat thermometer reads 165 degrees in the thickest part of the thigh. *If you do not have a rack for your roasting pan simple place the chicken on top of the potatoes for the full hour and a half. The potatoes will not over cook.